Beautiful You: OOTN | Drinks with flat mates! OOTN | Drinks with flat mates! If you follow me on twitter then you will know that the flat mates and I went out to Urban Reef again for some 'goodbye drinks' before we all leave for Easter. As what I wore was new I thought that I would share it with you all plus I am in love with the jacket you I needed to show you! I bought the jacket literally the day before we went out, I was out running errands with a flat mate taking things back and having a quick browse and I gave into temptation! I had been looking at this jacket for so long in Primark but because it was £15 it really put me off buying it but, I really really liked it so I bought it in the end! It is an orange structured jacket with blue flowers all over it, I just paired it with a plain black scoop neck t-shirt and blue skinny jeans! For my make-up I did a light grey eye pretty plain and then I drew a thin line along my upper lash line with a bright blue eye-shadow, to make it the consistency of liner I mixed in a spray of MAC Fix+ on the back of my hand! This didn't show up very well on camera so all the pictures I took didn't do it justice so I'm sorry I don't have a picture! For the rest of my face I just did my normal routine Revlon Colour Stay Foundation, Collection Lasting Perfection Concealer, Soap & Glory 'One Heck of a Blot' Powder, MUA Powder Shade 4 for bronzer and MAC Peaches on my cheeks! On my lips I just wore MACs Vegas Volt, which I am loving so much right now! 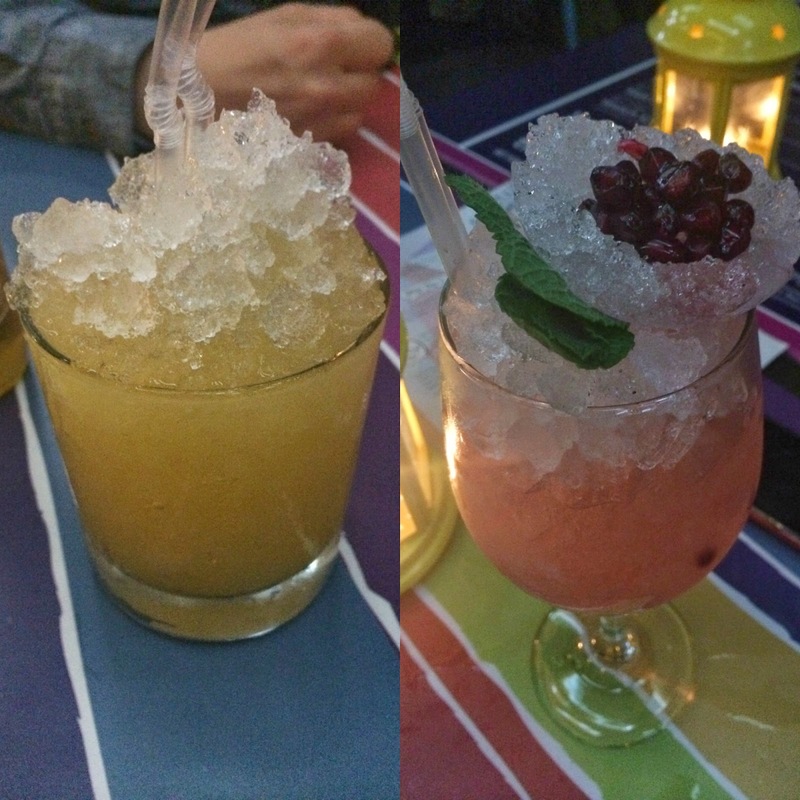 And of course I couldn't post this without having pictures of our cocktails, from left to right they are a Caribbean Daiquiri and a Pomeranian; both were sooo nice! I hope you enjoyed this outfit post, I am thinking of doing them more often so let me know if you like them and think that I should post more in the comments! I also just have to say a massive thank you for getting me to 200 followers on bloglovin, if you follow me on twitter you will know this but I said that I would do another giveaway on my blog when I reach 500 so lets aim high! I am also just going to say a quick hello to all my new followers and welcome to Beautiful You, if you are new leave a comment below saying hello and I will reply! I will see you all on Wednesday hopefully, it is my mum's birthday so I am in Bath all day but I will try and get something up for you lovelies! I adore your whole outfit. The jacket really adds a huge spark of colour to it!